For other uses of Uruk-hai see also: Uruk-hai (disambiguation). "Uruk-Hai" appears to be the Black Speech term for Uruks, the great soldier-orcs of Mordor and Isengard. Christopher Tolkien identified "uruks" as an "anglicisation" of "Uruk-hai". In, Saruman's orcs identify themselves as the "fighting Uruk-hai", and Uruk-hai is the common term used to refer to them. A tracker-orc in Mordor makes reference to a "pack of rebel Uruk-hai", apparently in reference towards Gorbag's troop of orcs who were Uruks of Mordor. 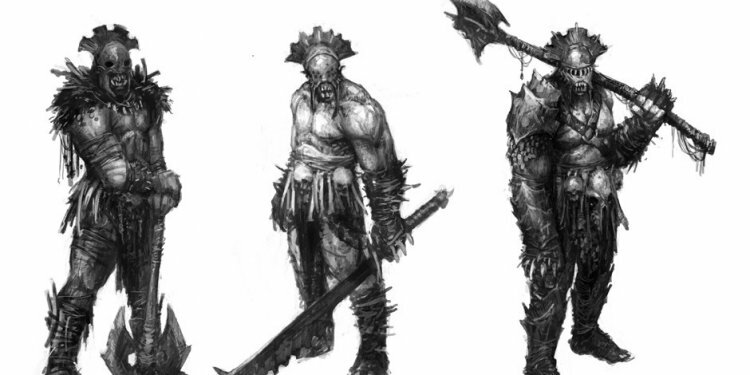 Tolkien described the Uruk-hai of Isengard as large, smart orcs with slanted eyes, thick legs, and large hands. They were armed with bows made of yew and short, broad-bladed swords. The Isengarders' equipment was noted as quite different from normal orcish gear (such as that used by the Uruks of Mordor). "We are the fighting Uruk-hai! We slew the great warrior. We took the prisoners. We are the servants of Saruman the Wise, The White Hand: The Hand that gives us man's-flesh to eat. We came out of Isengard, and led you here, and we shall lead you back by the way we choose." —The Lord of the Rings: The Two Towers, Chapter 3, "The Uruk-hai". Uruk-hai was a Black Speech word that meant "Orc-folk". The name "Uruk-hai" has the element Uruk, which was a Black Speech word related to orc, related to the (Valinórean) Quenya word urko (Ñoldorin Quenya: orko) of the same meaning. The element hai means "folk", so "Uruk-hai" is "Orc-folk". A similar term is Olog-hai ("troll-folk"), used for a breed of especially strong and vicious trolls capable of surviving sunlight. Christopher Tolkien describes "uruks" as an Anglicization of "Uruk-hai" and his father used the two terms interchangeably a number of times. Some readers assume the two terms are different because in The Lord of the Rings 'Uruk-hai' is used primarily to describe Saruman's forces while 'uruks' and 'Black Uruks of Mordor' are used primarily to describe Sauron's. However, there are examples of each term being used in reference to either group. While 'Uruk-hai' means simply 'Orc-folk', the term was reserved for the soldier orcs of Mordor and Isengard, with snaga ('slave') being their term for other breeds. In The Lord of the Rings movie trilogy by Peter Jackson, Saruman appeared to be the only one who created the Uruks. In The Fellowship of the Ring, Gandalf mentioned of Saruman breeding the Uruks to possess the traits of orcs and goblin men without the two races' weaknesses. However, the book cleared up this discrepancy by explaining that he is in fact only replicating the method that had already been used by Sauron. Sauron's uruks, seen in, have noticeably rougher features than Saruman's. They are shown in the movie as being released from a kind of membrane in the mud deep under Isengard (special commentary on the DVD edition explained that they were trying to base the scene on an early description of Tolkien's that orcs "worm their way out of the ground like maggots").